clhollandwriter | Entries tagged with shiny things! Entries tagged with shiny things! I thought I'd already done a post for this, but apparently I haven't. My mum spotted a necklace in M&S. She liked the style, but the colours didn't match what the person she was buying for liked so I volunteered to make something for her, in the required green. It turned out I didn't actually have a lot of green beads in my stash. I asked what other colours she liked: "orange, black, ivory, lemon". This isn't a great combination, so I decided on dark green, amber, and black (the recipient is a green-eyed redhead). Then I went shopping. 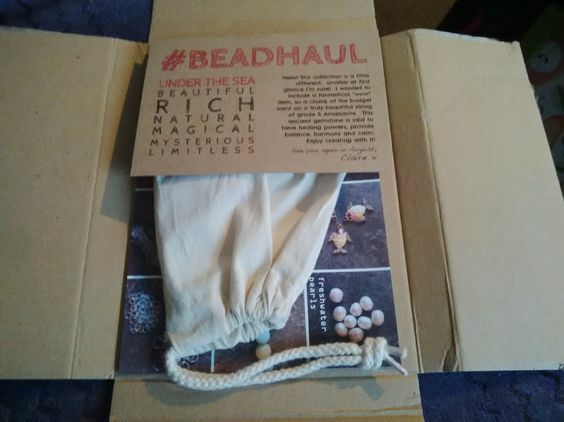 It turned out I could buy beads individually at Beads Unlimited, so I went searching for a selection of oval, round, and faceted beads in my chosen colours. The next step was to figure out how I wanted to string them. On the original necklace the beads were strung on transparent cord, with black cord knotted around them. I'd decided not to replicate this as it was fiddly and also meant some of the beads didn't hang right. I'd decided to string directly onto the main cord instead. Unfortunately I'm a really bad judge of size, so the beads turned out to be smaller than I expected. This wasn't a problem, except I had to go hunting for cord thin enough to string them on, and that meant the cord of the necklace would be thinner than I wanted and risk digging into the wearers neck. In the end I stuck to the plan of stringing the beads onto their separate cords and knotting between them, and then plaiting the three threads together to make the rest of the necklace a bit thicker. This was the result. For the clasp I made a loop in the cord, and added a random, reasonably-sized, green bead from my stash as the toggle. You can't see in the picture, but it has a spiral pattern. One minor tweak later (moving the green beads by the toggle down to where the cords meet in the second picture) and it was ready to go. Just a small jewellery project this month, as I'm working on a larger project and learning how to do wrapped loops. 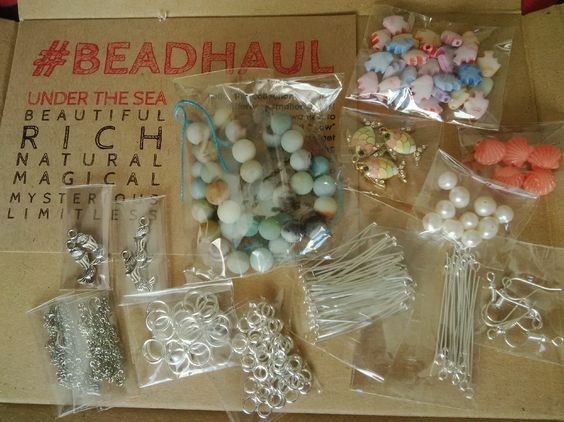 I saw these charms when I was looking for beads for the larger project, and couldn't resist buying a couple. A couple of earwires and flowers later and I had a pair of summery earrings. They're a little heavy (the strawberries are quite chunky) so I wouldn't want to wear them every day. I like them though, and for once I got something made while it was the season to wear it. I've been planning winter earrings since before Christmas that still haven't been made! I've decided to try and blog about my jewellery projects once a month. Not only will it give me something to post about, but having to post about it will keep me making things to post about. I'm hoping it will help to keep the momentum up on both of them. This month's project is a brooch I made for my grandmother at the beginning of the year. She loves foxes, and I found this little critter on Etsy. It's quite chunky, so I thought the best thing to go with was a brooch. At first I was going to hang chain from the loops on the pin and dangle leaves like it was hiding among the foliage, but it pretty quickly became obvious this was unworkable. Whatever I hung from the chain would strike the fox, and probably damage it. So I got rid of the chain. Not damaging the fox was a major consideration here, as was the fact that glass is quite heavy and I wanted to keep the weight of the brooch down or it could damage the clothes it was worn on. Being a hoarder I have lots of leaf charms. Glass ones were out, and the lucite ones were too big. I have several light metal ones, mostly in silver. However I thought the ones pictured above complemented the fox best, as they're quite small and in a sympathetic colour. Because it was a woodland scene I wanted to add some flowers, and picked some tiny lucite ones becasue they're light. I went for red to go with the warm colour scheme, and added a silver butterfly for contrast. I spent the first part of the session soldering a jump ring to my robin pendant. Here's a tip - always make sure you know exactly what your jump rings are made of before you put them in cleaning solution. Mine turned out to be (probably) steel-coated copper. The whole thing tarnished, and turned the pendant pink. Luckily Roland had some scraps of silver wire on hand, and I was able to make my own jump ring. And solder it on the pendant again. I was still not full of the love for soldering. 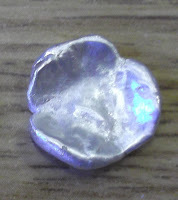 After it was soldered and in the pickle again, I decided to have a go at drop casting. Did you ever play the game where you drip candle wax into water to tell fortunes? It's like that but with molten silver. I sat down with some scrap silver, a blowtorch, a bowl of water, and a pair of massive safety gauntlets, and started playing. You don't get a great variety of shapes from this method, it turns out. Molten silver forms a ball, so a lot of the time the shapes are rounded. Sort of. And you need to pour it quickly or you end up with things like this. And yes, it is silver although it looks like copper. Oxides build up on the surface during heating and turn it funny colours. Eventually I had a piece in a shape I liked, and while it was in the pickle cleaning I finished cleaning up the pendant with pumice powder, tripoli, and jeweller's rouge. It turns out that most of the work in metal jewellery goes towards the finish, and it's easy to see why pieces cost as much as they do. It was a breakfast on day two that I finally had the idea for what I was going to make, and made some hasty scribbles. We learned about texturing and making granules (tiny little balls). Then it was time to start working on our designs. Although we could work in copper to practice if we wanted, I decided to jump straight in with silver. Time was limited, and I had the feeling I'd get bored with making the same thing twice. After selecting a small piece of silver from the selection we had, I cut the basic shape out with a piercing saw. Having discussed the idea of colouring the robin's red breast I decided against it and had a play around with texturing instead, on a scrap piece of copper. Once I found a texture I liked, I went at the robin and gave him bumpy feathers all over. The eye (which isn't really clear in the picture) was made with another punch, and then I selected one with a dotted line effect to mark out the beak and breast. The last part of the session was spent polishing the edges and untextured areas with wet and dry paper (like sandpaper for metalwork), and then burnishing the edges to strengthen them. I also punched a hole in the top of the pendant so it could hang from a jump ring. Part of the next session would be spent finishing off with polishing and adding a jump ring, but that left me wondering what to do with the rest of the time. Luckily Roland had mentioned drop casting - pouring molten silver into water to see what shapes you get - and I had the idea that maybe I could give that a try and see if it would give me some inspiration. In the spirit of doing something different, my boyfriend and I booked ourselves onto a course on metal jewellery for beginners over a couple of weekends. It was a strictly for the love course - although there's a certificate for completing it, it doesn't form any sort of formal qualification. The first session was entirely devoted to learning about the techniques and tools. We each had a toolbox, and the tutor, Roland George, took us through the tools and explained what they were all for. Because the kits were used by students in other classes each one had a pretty random selection, and swapping items around proved to be a great ice-breaker. There were five of us on the course, me, my boyfriend (the only man), and three ladies with varying levels of experience: two had been on on a course before but not done any metalwork outside this and the other hadn't done any jewellery work at all. After the introduction, Roland had us all grab some of the scrap metal from the tool kits - there was plenty of pre-loved copper and brass sheet knocking around - and had us practice cutting out shapes with the piercing saw. After lunch we learned about how to shape rings, about annealing (heating to soften the metal for working), and soldering. The project was to make a basic copper ring from scratch: select the metal; cut a strip with the saw; shape a ring (annealing when necessary); solder the joint closed; pickle it to clean; and file to remove the excess solder and neaten the edges. I learned a lot from this, including that I hate soldering. Solder seems to have a mind of its own. When heated it forms a ball which sits there for ages not doing anything. then all of a sudden it flows, and usually not in the direction you want it to. This was not my only encounter with soldering over the course, and I have to say it hadn't grown on my by the end. My ring came out wonky as I didn't manage to cut a straight piece of copper to start, but that didn't really matter since it was the shaping and soldering that was important at this stage. It photographs well, anyway. After this it was time to go, and we were given our homework for the next day's session: if we didn't already have a project in mind to think of one. I was already pretty sure I didn't want to make a ring, but beyond that I had no idea. Inspiration wouldn't strike until breakfast the following day. Last weekend my boyfriend spotted this in a charity shop. Knowing my fondness for boxes, and being the sweetheart that he is, he bought it for me. Pliers and most of my chains and cords are in the main cabinet, findings and other bits and bobs in the drawer. It's much more organised than my shoebox, if less portable. Now I just have to find something similar for my beads. On the writing front, I'm slightly stuff on the fact that I know how my story starts, but can't begin it until I know the characters' names. Sigh. Is it just me or has LJ been a bit quite lately? Is there some exodus going on no one's told me about? Oh, well. On the off-chance that anyone's reading this, here's some shameless self-promotion: Amber Sistla has interviewed me as part of her Writer Wednesday project. And I've made a couple more posts at my jewellery blog. There's not a lot else going on at the moment, except work and insomnia. No longer the human snot fountain. Been mostly offline for a while - it turns out that being a human snot fountain isn't really compatible with typing. Oh well, all better now. The camera issue is now sorted - the BF bought me a new one. It's shiny. And purple. And, more importantly, it actually talks to my computer. The end result is a ton of pics of all the shiny things I've made since November. I thought about posting some up, but frankly there are rather a lot and I don't want to annoy people by turning my blog into shiny! piccy! spam! central! so I've started a Facebook page for them: http://www.facebook.com/XanthalanariUK. * That way people can look at them if they choose to. All of which doesn't mean there won't be any pictures at all. I thought I'd share this one, since it's something I've been trying to make for a little while. When I was ten or so, I had a charm bracelet that was full of leaf charms, which I loved but wasn't confident enough to wear. In the end I got rid of it and always regretted that. So this is my attempt to recreate something of the feel of that bracelet. The chain came from a charity shop necklace, and the holly leaves and leaf-shaped charms with stones came from another necklace. The metal leaves came from a shop on Etsy, and the glass ones (green/grey/black) from BeadsDirect.com. I'm not sure it's quite finished, I'll probably swap out the plain metal leaves for others as and when I find them, but I like it. *In the spirit of full disclosure - there is a link to my Etsy shop on there, but only one and not on the page with the photos. My brain: Here, have this story idea! My brain: Plenty of time to write it for this Christmas then! Why is is that I feel more frustrated about not getting things done on a day I've been busy than when I've been lazy? Yesterday I wrote a flash story, caught up on some correspondence and admin, dismantled three or four necklaces for my bead stash, watched "The Hunt for Red October" (the BF has recently become obssessed with submarines), scribbled some notes for jewellery designs, did the washing up.... And I still don't feel like it was enough. I recently discovered a great crafting blog, It's a Creative World. The team there cover everthing from cooking, knitting, beading, papercraft. The only problem is that now I want to try some of those hobbies too. There aren't enough hoirs in the day! Plus they have an adorable knitted Lemming in this post.